Holding a Ryzen CPU in your hand offers absolutely no benefit. AMD today launches the first three models of its Ryzen desktop processor, a trio of eight-core CPUs that promise power to rival Intel’s finest at a more accessible price point. AMD has spent four years and thousands of hours working on the Zen core microarchitecture, and the three Ryzen processors launched today represent the culmination of that work. Available today for do-it-yourselfers or in a wide array of systems from boutique PC builders, the first three Ryzen CPUs offer an amazing power-to-price ratio. 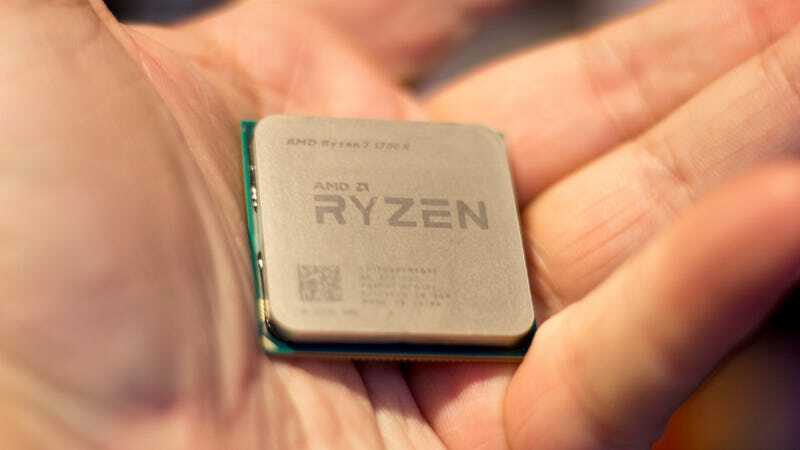 Early testing indicates the the Ryzen CPUs outperform their Intel counterparts in multiple areas—our friends at Techspot are already impressed—though early gaming benchmarks show Intel still on top. I’m putting together a Ryzen system at the moment, with the 1700 and 1700X queued up for vigorous testing. Look for some results from that next week. Whatever happens, the CPU market is suddenly much more interesting than it’s been in years.